There’s a delicate balance to creating great Trust websites; you need to build on the strength of your Trust’s brand as a whole and simultaneously promote the unique identity of each member school. Sounds challenging, but in our experience it’s definitely achievable. At Cleverbox, we work with over 50 Trusts in the UK, from small groups comprised of less than a handful of schools to some of the largest Trust system leaders in the UK like Harris Federation and TKAT. And every single Trust we work with is unique. But over the past 20 years, we’ve established some consistent trends for how to approach designing great Trust websites and sites for member schools. 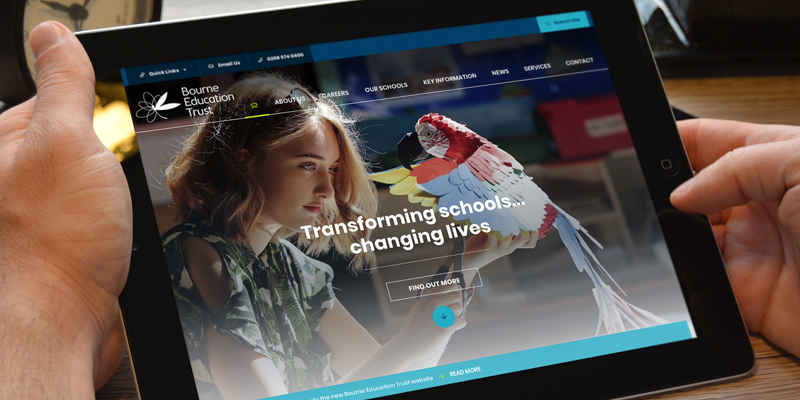 We now know how to ensure the Trust website serves as a powerful branding tool for stakeholders, whilst member school sites offer effective and engaging digital experiences for families and staff. Before you begin looking at your Trust website, we’d suggest you spend time refining your brand. What is the ethos of your Trust? What look and feel do you want to echo across all marketing materials and assets for member schools? Should you create one logo for all or can you achieve consistency without changing existing school badges? A great initiative we’ve implemented for many schools and Trusts is a collaborative approach to branding. For example, the Knole Academy logo was designed by Cleverbox in partnership with art and design students at the school. The logo is a triumph by the team and has led to a shared love and appreciation for the school’s brand by students and staff alike. 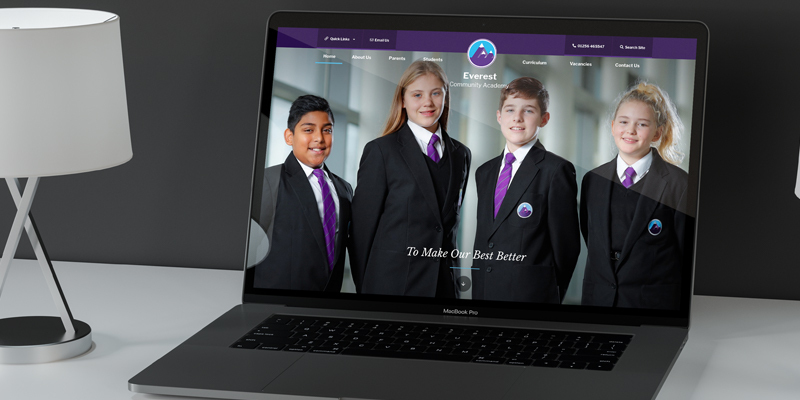 A great example of how to achieve consistency of design for your Trust’s brand across all your school websites, whilst retaining an individual logo for each school, is illustrated here across member school logos within the Harris Federation. Logos are different but all possess a similar quality that unifies them. The Harris Federation logo is displayed alongside individual schools’ logos on each school’s website to keep the Trust brand front of mind. You can’t please everyone. 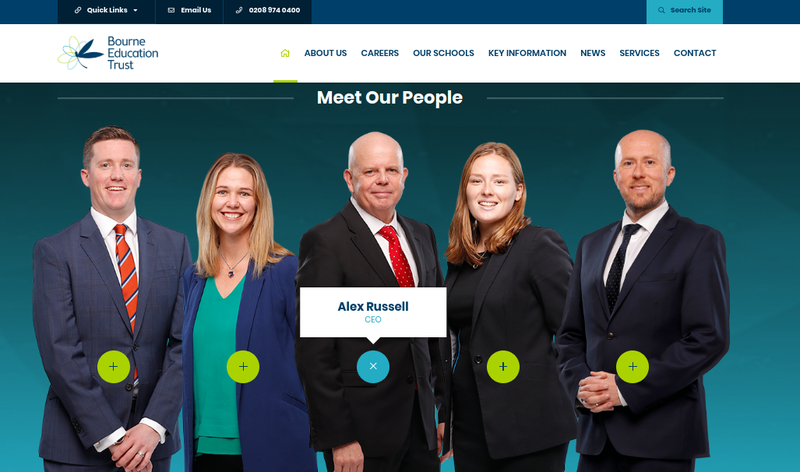 But, as a Trust with multiple stakeholders who have very different wants and needs, you should try to cater for them differently on your Trust site and individual school websites. We recommend thinking about your audiences at an individual level, then tailoring each touchpoint to appeal to the type of person who is likely to engage with it. For example, if your Trust website focuses on recruitment and reputation, you may wish to update the content on your homepage if you’re recruiting for a particularly high profile role, or if you’ve recently received coverage in the media. Similarly, your presence on social media can adapt according to who you’re trying to engage with on a particular day. Twitter is a brilliant channel to engage directly with prospective and existing stakeholders and your tone and approach should be less formal and more conversational than the copy on your website. Integrating a live Twitter feed on your homepage is a great way to keep content fresh and deliver real-time news on your Trust website. By linking the feed to your News blog, updates will be made to your feed automatically, whenever a new post is published. Member school sites should focus on the values of each specific school and the academic opportunities, activities and environment they offer to families, rather than speaking about your Trust and brand. Let’s face it, statutory and policy documents aren’t the most exciting aspects of your Trust website, but they’re absolutely critical to your brand’s success. Many of our Trust clients use a Key Information module to consolidate and display their policies in a format that is easy to view. Most importantly, this section is responsive on all devices, so visitors can enjoy the same ease of use whether they’re searching for GDPR information on their mobile phone or viewing Press Releases on their PC. Few things are more annoying than trying to view a Policies page on your mobile if it’s not optimised – many visitors will give up and leave your website out of sheer frustration, which is not a great reflection of your Trust’s brand! There are multiple ways in which you can show which schools are members of your Trust. The way you approach this depends on the volume of schools you have, the level of independence your schools require and whether all schools sit on the same web platform as your Trust website. 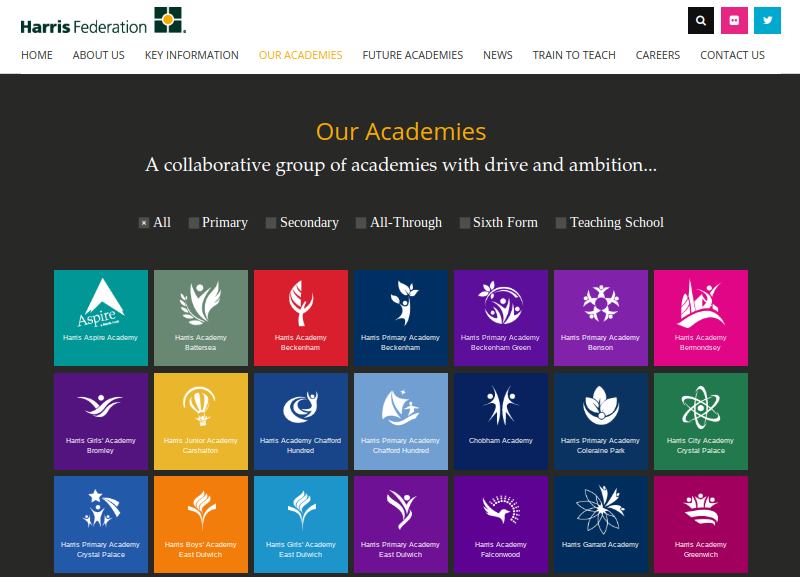 For Trusts with a handful of member academies, you can provide a route to each academy website using a fixed scrolling bar on your homepage, as shown below for the Scholars’ Education Trust website. For large Multi-Academy Trusts, we recommend a standalone page with a visual guide to all member schools. 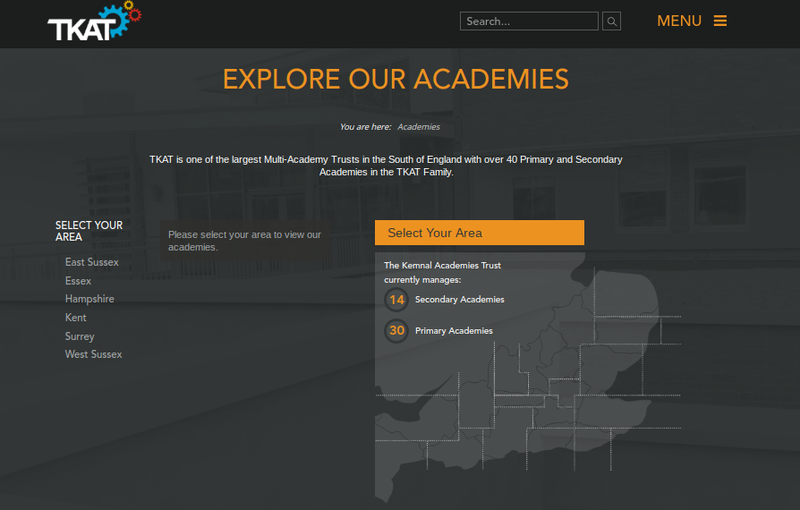 The interactive map on the TKAT Trust website is a really engaging way to encourage stakeholders and website visitors to connect with member schools. Your Trust website should be informative and useful but it should also be exciting, engaging and interesting to use. With the evolution of technology, information can be displayed in a multitude of beautiful ways! For example, it’s possible to introduce your key leadership team in an interactive and highly visual way. In this example taken from the Bourne Education Trust website, each job title is shown on hover of the relevant person and clicking on their profile takes you to a short bio page. This format shows the professionalism of the Trust brand, without feeling stuffy or dull. These are just a few examples of great Trust websites and some common themes they share. Your Trust website can serve as a powerful tool to strengthen your brand, if used effectively. And with consideration for your audiences, reputation and objectives, you too can create a fantastic website for your Trust and member schools. Cleverbox has been a leader in the education sector for 20 years and we work with over 50 Trusts in the UK. We offer a consultative, strategic and personalised service to every Trust we work with. Get in touch to find out how we can help your Trust become a recognised market leader! Call us on 0208 466 7222, email us at [email protected] or pick a date and we’ll call you back.